Loose Bass Strings Are My Boyfriend. Segall’s “Sleeper” Is Romantic Psychedlic. Marry Me. When you think about Ty Segall, you think about the lobes of your brain splitting into…what is it? Six? Yeah, it’s six. And if you haven’t heard Ty Segall, then it’s a whole other story. I am envious. Because that means you can bathe in his music for the first time. You lucky, lucky human being. Back in May, Segall announced his new record with a brief trailer featuring the title track. The trailer is a hilarious series of him asleep in all the wrong places. Funny guy. A lot’s happened since then. I’ve listened to countless records (and watched too much TV). I spent time down the hip hop rabbit hole. But, in the end, July and August have been a musical bore. I’ve written about listening to nothing lately. It’s been frustrating, leaving me frantic, driving me to the radio. But now, there’s no need to panic. Sleeper is here. Segall is known for shredding and pure volume. The colors are so bright that it’s hard to see the speakers. But Sleeper, on the other hand, is an acoustic, charming record. It has a hold on you and fits like a peg in any hour of the day. And without losing his psychedelic stripes, Sleeper is just showing us his range. Take “The Man Man.” It has the questionable lyrics we’re used to “he went to the water side/they stuffed his foot in/and crawled inside/up the river/to your skull/down your body/he/made you crawl/out your mouth/in my ear/he said the special things/only I would want to hear.” The acoustic guitar was made for this song. [Hear it below.] Until the solo at the 2:15 break gets vibrant, quiet and then the electric kicks in. You get dipped and you trip. Your face will light up and if you’ve never played it before, the electric guitar will find your fingers. Ty is the man. And the reverb is ruler. Ty Segall is doing us all a favor. People act astounded at the quickness of his releases and the amount of bands he’s a part of. (Three records out last year – all fantastic – and the number of bands growing.) But if someone has found something they love, shouldn’t we just be lucky that they’re willing to pull their weight? And deliver? 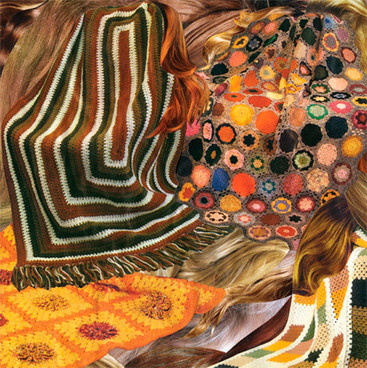 In the tradition of San Francisco folk and psychedelic rock, Segall is exploring his roots on Sleeper. He understands the city that helped build the music he makes. You may have heard of bands like Jefferson Airplane, The Grateful Dead, Quick Silver Messenger Service and Moby Grape. (And if not, you lucky human. I would pay big money to hear Jefferson Airplane for the first time again.) You also may have heard of The Velvet Underground. I don’t take it lightly to anyone being compared to The Velvets. Ever. But there’s something to be said about “Queen Lullabye.” I think you’ll know what I mean. [Hear it below.] The buildup of looping feedback and distortion at the end of this track is better than any other rumbling of psychedelia in years. It pays a nice tribute to the genre’s forefathers. Segall is outdoing himself. What more can I say about Sleeper? That the strumming and chord progressions on “The West” lace up perfectly? Or that you’ll swoon over “The Keepers” and the whistle-along chorus? And the backwards strings? WHAT MORE CAN I SAY? Sleeper is electric. It’s gonna wake you right up. Sleeper is out Tuesday on Drag City.